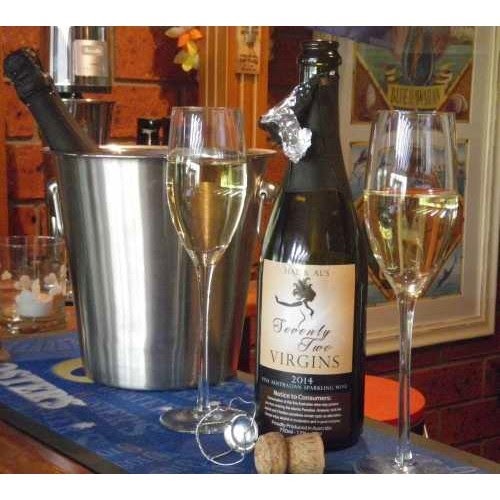 Q Society, an anti-Islamic organization/think-tank based in Australia, created 'Hal & Al's Seventy Two Virgins' wine (a sparkling Brut) as a fundraiser of sorts. Profit from sales are to be used by the organization to combat Islamic extremism, and what they deem as a culture war. Islam is not just a religion. It is also a political, legal, financial, social and military doctrine which extends to all facets of Muslim life, the cultural and legal landscape of where Muslims live and how to treat non-Muslims. Islam makes it obligatory for observant Muslims to assist in extending the rule of Islam across the world. For too long Islam has enjoyed immunity from necessary analysis, due criticism and debate because of its status as “just a religion.” Unfortunately, if we continue to tolerate Islam without understanding it, Australia as a free, secular democracy will be lost. This approach for criticizing Islam is from the “classical liberal” position, which is embraced by those both on the political left (such as atheists like Bill Maher) and the right. The Q Society affirms in their “Australian Values” statement that they oppose Islam specifically because it conflicts with the liberal values and openminded ideology of modern Australian culture. “Consumption of this Australian wine may prevent you from entering the Islamic Paradise. However, both the Jewish and Christian paradises remain open as alternative…." You could have purchased a bottle on their website for $72.00 Aussie, but it's already sold out. But they have a Halal shopping bag in stock for $5.00. You know that if it was an American organization, the Council on American-Islamic Relations (CAIR) would already have their lawyers on the case.